Auctioneers, Dreweatts, are offering for sale the 1928 Grant of Supporters to George Abraham Gibbs following his advancement to the dignity of Baron Wraxall. Included in the sale is the document of ennoblement. The auction is to be held on 1st May 2019 at Newbury. The auctioneer’s estimate is £300-£500. Arms: Argent three battleaxes erect Sable a bordure nebuly of the last. Crest: In front of a rock a dexter arm embowed in armour the hand in a gauntlet proper bearing a battle-axe bendwise sinister Sable. The Arms were granted in 1876 to Henry Hucks Gibbs, 1st Baron Aldenham, and descendants of his grandfather Antony Gibbs. The latter was George Abraham Gibbs’s great-grandfather. Supporters: On either side a St Kilda sheep proper each charged on the shoulder with a portcullis Or. Auctioneers Cheffins of Cambridge are offering for sale the 1919 Grant of Arms to John Evelyn Ansell (b.1860 d.1936) of Glenloch Road. The auction is due to be held 21st February. There is no auctioneer’s estimate. Arms: Gules on a saltire Argent between four bezants two swords in saltire proper pommelled and hilted Or. Crest: A torteau charged with two swords as in the Arms. John Evelyn Ansell and his wife, Ada Maria, had two children, Enid (b.1897) and Evelyn (b.1898 d.1970). Evelyn married Mary L S Eaton in 1928 and lived in Cambridge. They had two daughters, Meryll Carinthia (b.1930) and Rosemary (b.1934). eBay vendor musicmob-uk is offering for sale an exemplification of the Arms of Sir Herbert Benjamin Cohen Bt (b.1874 d.1968). Current price £29.99. Arms: Argent on a chevron Gules cottised Azure between two roses of the second barbed and seeded proper in chief and a buck’s head couped also proper in base three annulets Or. Crest: A buck’s head couped Argent armed Or gorged with a wreath of oak proper and charged with four barrulets Gules in the mouth a rose of the last slipped proper. Lawrences of Crewkerne are offering for sale a Victorian gold mounted agate seal. Can you identify the Arms? I have un-reversed the image so that the Arms are “true”. No prizes I am afraid. Arms: Or on a bend Sable between two late medieval swords bendwise points downward proper a stag’s head couped Or between two celtic crosses Argent. eBay vendor, scooterboysx175, is offering for sale the 1905 Grant of Arms to Herbert Eccles (b.1858 d.1928) of Penrhiewtyn House Llantwit Lower, County Glamorgan. The asking price is £495.00. Arms: Argent a chevron Gules between the eagles displayed Azure on a chief of the last two bees volant Or. Crest: A bee volant between two thistles in saltire slipped and leaved all proper. Herbert’s two sons were Alexander Herbert Lindsey Eccles (14 May 1908 – 29 Aug 1991) and Roy Hector Eccles (2 Dec 1900 – 17 Jan 1938) and are listed amongst The Golden Age of Grand Prix Drivers 1934-40.
eBay vendor archaeological_historical is offering for sale the 1798 Grant of Supporters to the Rt Hon Lieutenant General Sir Ralph Abercromby Knight Companion of the Most Honorable Military Order of the Bath. The current asking price is £499.99. Arms: Argent a chevron indented Gules between three boars’ heads erased Azure armed Or and langued Sable in the middle chief point a crescent Vert. Supporters: On either side a greyhound per fess Argent and Or collar and line Gules charged on the shoulder with a thistle proper. Somerset based auctioneers, Lawrences, are offering for sale on the 18th January a rather splendid but small (39cm by 39cm) hatchment for a Marquess. However, the Arms are unidentified, even with the assistance of the Heraldry Society. Therefore, it seems likely that this is a sample or a promotional example. The auctioneer’s estimate is £50 to £100. – UPDATE Sold for £400 Arms: Gules on a fess Argent between three mullets erminois a lion passant guardant Sable. Crest: An eagles’s head erased Or gorged with a collar gemelle Azure ducally crowned Gules . Supporters: Two griffins proper collard Or. If these Arms have not been Granted in England & Wales, Ireland or Scotland, perhaps some non-armigerous individual can petition for them? All they need do thereafter is work out how they can be ennobled as a Marquess. The pedigree of Gollop of North Bowood and Strode first appears in the 1623 Visitation of Dorset but without any recorded Arms. However, in the Harleian Society’s Visitation of Dorset 1677 (published 1977) the Arms are recorded as “Quarterly: 1 and 4, Gules on a bend or a lion sable; 2 and 3, Azure, a bear passant argent”. Whilst the published pedigree does mention two heiresses, it is not clear from whom the Bear Passant is inherited. “We have looked at the two grants you mentioned. The first (Coll. Arms Grants 3/162), is not a grant, but an assignation of tinctures. It seems Thomas Gallop, son of Thomas Gallop, appeared at the College with a ‘much worne’ seal ring which he said had been used by his father for many years. 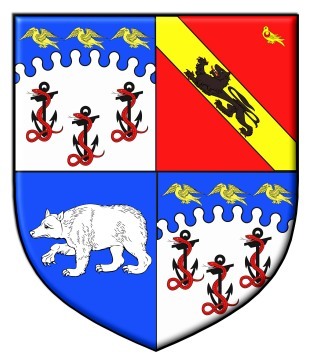 Despite the fact that no arms were recorded for the family at the visitation of Dorset in 1623, the heralds seem to have accepted the arms on the seal – On a Bend a Lion passant – as the arms of the family and ‘granted and assigned’ the tinctures Gules on a Bend Or a Lion passant Sable armed and langued Gules. 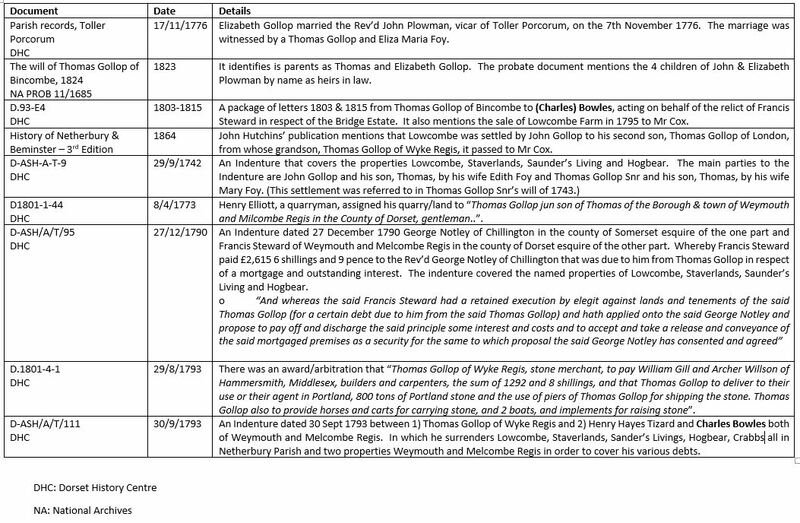 The confirmation was to ‘the said Thomas Gollop’, which is a little unhelpful considering both father and son are mentioned earlier, and the patent is dated the 30th October 1682. It was also noted that the quartering with a Bear was unidentified in the 1677 Visitation and seems to be its only occurrence in the College records. Looking at the published pedigrees, I think 1. Thomas Gollop would have been the signatory of the 1623 Visitation and 1.1. Thomas Gollop that for the 1677 Visitation. What is not clear is which Thomas Gollop petitioned for the two “Grants”. Initially I thought it was 1.1. in 1682 and then 1.1.1. in 1720. However, re-reading the College’s response, I suspect it was Thomas Gollop (b.1640 dsp.1727), he would have been aged 42 and 80 respectively for each Grant. The latter Thomas was the eldest of 12 brothers, at least five of which had children. Incidentally, the North Bowood & Strode estates, by agreement, passed to the fourth son, John. Crest: A demi lion bendy Or and Sable holding in the dexter paw a broken arrow Gules. My interest in the Dorset Gollops started when I tried to identify the family of my paternal great-great-great-great grandmother Elizabeth Gollop and any connection with the armigerous family of Gollop of Strode. She married the Rev’d John Plowman at Toller Porcorum, Dorset, on 7th November 1776. The marriage was witnessed by a Thomas Gollop and Eliza Maria Foy. The first hint at a possible connection was Eliza Maria Foy. The two sons of the John Gollop of Strode mentioned above, John & Thomas, married two Foy sisters. Eliza was either the wife of their nephew or his daughter. I was unable to find any further details about Elizabeth Gollop in parish records, partly due the fact that Thomas and Elizabeth were the most popular Christian names in Dorset. However, by checking the wills of multiple Thomas Gollops I found her brother (died 1823) and the name of her father, also Thomas. Various documents* held by the Dorset History Centre showed that her brother had financial difficulties over a number of years. By following a number of Indentures that concerned Lowcombe Farm (also Staverlands, Saunder’s Living and Hogbear) in North Bowood it was possible to track its ownership from her brother back to the 1690s. That showed that their grandparent were Thomas Gollop and Mary Foy. Salisbury based auctioneers, Woolley & Wallis, are offering for sale three carved and painted wood coats of arms. Two of which have inscriptions identifying the armigers. The sale in on 9th January with an Auctioneer’s estimate of £300-400. [Left]: John Bracebridge Ludford, Barrister-at-Law, Inner Temple, Lector 1772. [Right]: Samuel Bracebridge, Barrister-at-Law, Inner Temple, Lector 1731. John Bracebridge Ludford’s father, another Samuel Bracebridge, was a first cousin of the Samuel Bracebridge above. He changed his name to Ludford. I have yet to identify the third, top most set of quarterly Arms. Forum Auctions are offering for sale the Coat of arms of Edwards of Toxteth Park, Liverpool and Broughton Park, Manchester, watercolour coat of arms, on vellum. Arms: Quarterly 1st & 4th Or a pile Azure over all a chevron counterchanged between three horses’ heads erased Argent (for Edwards) 2nd & 3rd Per bend sinister ermine and ermines a lion Rampant Or. Crest: A man in complete armour resting his dexter hand on a sword point downwards proper and supporting with his sinister hand a shield of the Arms of Edwards. Auctioneers Lyon & Turnbull of Edinburgh are offering for sale the framed 1798 Grant of Arms to the County of Roxburgh. The County of Roxburgh was the first Scottish county to receive a Grant of Arms. The auction is due on 2nd October with an auctioneer’s estimate of £100 – £150. Arms: Azure a unicorn salient Argent horned maned and unguled Or the tail tufted of the last on a chief of the second a hunting-horn Sable stringed and viroled Gules between two esquires’ helmets of the field. Crest: A dexter arm from the shoulder vambraced and brandishing a scimitar aloft proper. The last hilted and pommelled Or.